Gloc-9 Breaks His Silence on Performing at Binay's Campaign Rally! 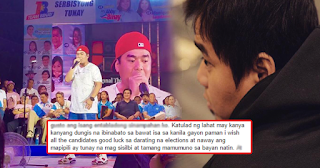 Nationally-renowned rapper Gloc-9 performing on stage during VP Binay’s campaign rally is currently making a buzz on social media earning negative feedbacks from Netizens especially for his crowds of fans who saw his photo as an open endorsement of the controversial politician. The acclaimed hip hop artist took the stage at Binay’s Easter Sunday sortie in Noveleta, Cavite and again in Makati on Monday at the proclamation rally of Makati representative Abby Binay, who is running for the mayoralty seat previously held by her brother, Jejomar Jr.
On both occasions, Gloc-9 performed his new song “Pareho Tayo”. When it was acquired by the Binay campaign in early February, he denied that he was endorsing the Vice President. He said he would refuse offers to write campaign jingles for candidates in the upcoming national elections. The lyrics echo Binay’s claim of sympathy with the poor despite being accused of gathering billions of pesos in anomalous transactions during his long reign as Makati mayor. 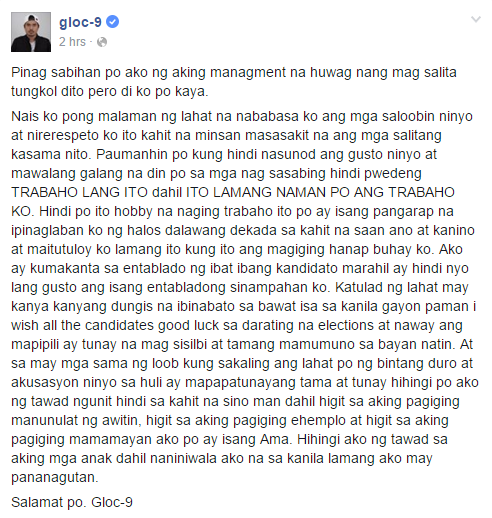 In his defense, Gloc9 seemed to be sticking to his stand that he was not directly endorsing Binay but had only joined his campaign as a performer-for-hire. In a verse he posted to his Facebook page as a meme on Monday, he said, “Hanggat walang kamay na itinataas, dapat walang bibig na bumubukas.” (As long as nobody’s hand is being raised, no tongues should wag). The post came with several hashtags, including #parasaanak, #kayod, and #labada. He also posted on Facebook a message for his fans and bashers explaining why he performed on stage for Binay.